Leaves of the Trees: Liebster Blog! This award is given to blogs with less then 200 followers that you think deserve a little bit more recognition. 1) Show your thanks by linking the sweet person who nominated you. 2) Leave links to 5 of your top blogs and leave a comment letting them know! I follow a lot of great blogs, so this is going to be very difficult for me to choose. You are all wonderful bloggers and I send my love to you. These girls are awesome and you should definitely go check out their blogs if you haven't already. The gorgeous and dear friend in real-life, Carlie from Duplechin Daily. The beautiful and hilarious Leslie from Show the Wonder. The sweet-as-pie and creative blogger Natalie from Scribbles 'n things. The talented and pretty Lauren from Living Loved. The stunning and kind Berni from Zimmbernii. 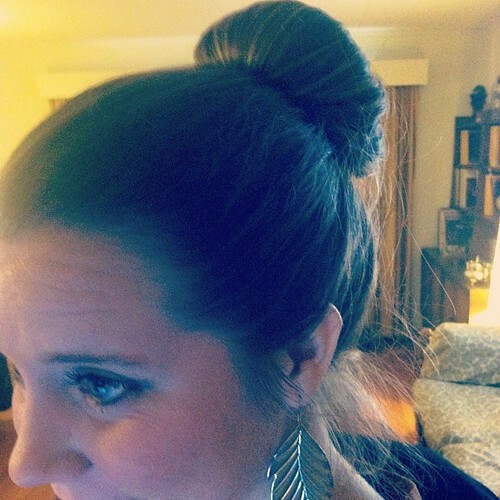 sock buns are my new favorites! Well aren't you just the sweetest ever! I wish I was coming to Carlie's wedding to dance and hang out with both of you! (Is that weird? Haha I hope not!) I'm thankful for our blog friendship and I'm certain it would translate into 'real life' friendship easily :) If only we lived a bit closer! Aww! I'm glad you think I'm as sweet as pie! ;) Thank you! Ahhh! My first blog nomination - I feel so honored, Breanne! Thank you so much for thinking of me :) Can't wait to post about this. Love you! Congrats to all of the blogs! I can't wait to check them out! I so thought I already commented on this! Weird... apologies if this is the second comment you've seen! Thank you so much for the shout out! That's so sweet and such an honour :) I have loved getting to know you better through the blog world - your blog really inspires me! and i LOVE sock buns. I get so many copmliments when I wear them and I get such a kick out of telling them 'thanks! there's a sock in there...'and then people try and figure out how! haha..
You have instagram now! Woohoo! Hey Breanne, I sent you an email... did you get it?